ECDSA welcomes one and all at St James’ Park. A question for you: do you or anyone you know have a disability that affects your / their match day experience at our football club? If so we would like to hear from you. Through our membership and various fund raising initiatives ECDSA has raised funds to help improve the match day experience for home and away fans during their visit to St James’ Park as well as helping other disability groups. For example last season ECDSA purchased an attendant style wheelchair for use by anyone visiting the club who is in need of one – please ask for this at the main reception. In addition ECDSA made donations to the club’s Ability Counts Football Team. These are just two examples of the many things ECDSA has achieved over the past 9 years. ECDSA would like to see its membership break the 100 mark this season (65 members for 2015/16) and there is no better time, than at the beginning of a new campaign, to join ECDSA. 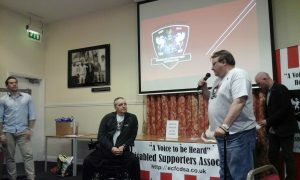 We welcome all supporters; you don’t have to have a disability to join us. So if you’ve an interest in helping us improve the match day experience of both home and away fans with disabilities or would just like to join us then we would like to hear from you. Membership is just £5.00 per person per season. 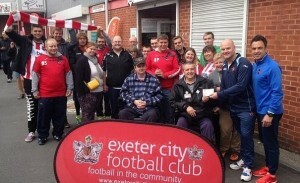 ECDSA members are included in the Exeter City FC priority group ticket database. Application forms to become a member of ECDSA can be downloaded from our new website at: JOIN-US or are available at the Club reception. 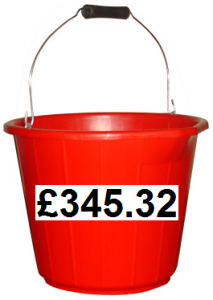 ARE DELIGHTED TO ANNOUNCE THAT A WHOPPING £345.32 WAS DONATED DURING THE HALF TIME BUCKET COLLECTION AT THE PORTSMOUTH MATCH ON SATURDAY 27TH AUGUST 2016. The 16th April 2016 was an important date in the 2015/16 League 2 calendar for two reasons. Firstly the visitors to St James’ Park that day were Northampton Town and the 0-0 draw they achieved with City meant that they [Northampton Town] were crowned League 2 champions. The secondly and more importantly for our club, was the invitation given by the club in association with ECDSA to a number of disabled ex-service personnel to attend the game under the Level Playing Field’s initiative ‘Weeks of Action’. As a follow up to that ‘Weeks of Action’ event THE GRECIAN caught up with ECDSA committee member Martin Robertson who made it all happen. Q – Martin how long have you been a City fan? A – My first game was back in the 60s when my father brought me to the Park when he was stationed locally. As a small boy I remember enjoying the atmosphere and a good game on a muddy pitch. Q – What did you do when you left school? A – I joined the Army in July 1972 and in that September I joined the Army Apprentice College in Aldershot for 6 terms training. 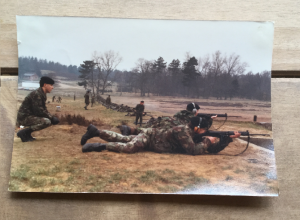 It was a great experience – basic training was for one term, which included, drill, rifle drill, weapon training, map reading, live firing on the ranges, running, combat fitness testing, march and shoot competitions, etc, the food was excellent, we were well fed, breakfast, lunch, tea plus supper. Pay was pretty poor though at £1.50 a week so money was always tight during my 18 months training as a boy soldier. Q – How long were you in the Army? A – When I retired from the Army in 1996 I had served a total of 24 years exemplary service both home and abroad. I have experienced the good and the bad, I have met some fantastic people and I have many friends. I am a disabled veteran now and in receipt of a war pension as a result of injuries I received through service. Q – Tell us a bit about your charity work. A – When serving I did a lot of work for Armed Forces charities such as, Toch H, SSAFA, the Royal British Legion, the Chelsea Hospital and latterly Help for Heroes. All these organisations are superb, they help serving soldiers, sailors and airmen, their families and anyone who has had a link with the armed forces. Q – How does your disability affect you at games? A – Getting to the Park is really difficult for me. You may have seen me struggling up and down the stairs by block H. I arrive at the park early and leave on 88 minutes so I don’t get in the way of exiting fans. I have to park my car near to the ground as I can’t walk far these days. I am a fighter and living with a disability is a challenge. 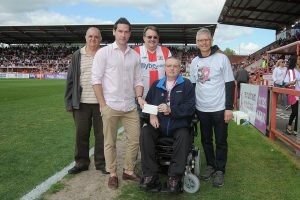 Disability is very hard but luckily at the club we have a fantastic organisation, the Exeter City Disabled Supporters Association (ECDSA) who work extremely hard behind the scenes to ensure that all disabled fans have access to the park and enjoy the experience of watching football the same as able bodied people. Q – Tell us why you put together the ‘Weeks of Action’ event for disabled ex-service personnel? A – Our disabled ex-servicemen and women are an asset to our nation; some are not able to attend home games mainly because of their disability and also because of cost. 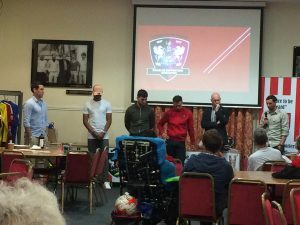 The Club have been outstanding in supporting the work of ECDSA and Andy Gillard, the clubs Operations Manager, has been amazing in recognising the help disabled people need. 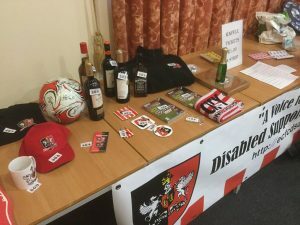 Each season ECDSA tries to put on an event to support Level Playing Field’s ‘Weeks of Action’ thus helping to highlight the positive initiatives undertaken by clubs, sporting venues and their governing bodies in partnership with disabled sports fans and disabled supporters associations. I thought it would be a good idea to show the club’s support for the ‘Weeks of Action’ initiative if the club could invite a small number of disabled ex-service personnel and their carers to a match who otherwise would not be able to attend. The club kindly agreed to this and as a result I arranged, through the various associations and charities I am involved with, for 4 disabled ex-service personnel and their carers to attend the Northampton Town game. Q – Are you planning any follow up action from the event? A – I would love it for the club to allow disabled veterans regular access to the park so that they can enjoy the match day experience the same as the able bodied do. The various charities and associations that support the brave men and woman are self supporting and they are grateful to the public for donating to these worthy causes. Our little club is small but has loads of caring supporters. ECDSA is a fantastic organisation with around 65 members. Membership is just £5.00 per person and you don’t have to be disabled to be a member. On a personal note I would like to urge all clubs to give all service personnel discounted prices (maybe at the same level as they do for seniors) for them and their close families upon production of an official ID card as proof. As many of them serve away from home for months at a time and are unable to attend games regularly it’s an opportunity for them to bond with their families at a sporting event. Another thought I have is for clubs to allow supporters with a registered disability free access to games say for three games a season. Remember disability can be both physical and mental; both are a challenge to the individual and their families. We recently took delivery of two new banners which we’ll use to help promote our organisation. These have been very generously donated by Signs Express (Exeter) free of charge. The new banners will be put to use in Red Square on Saturday, October 22nd before the start of the Cambridge United game when we start to sell raffle tickets for our Christmas draw. We are still on the hunt for raffle prizes, so if you’re able to donate a prize or willing to sell draw tickets on our behalf please contact Nick Saunders @ ecfcdsa@gmail.com or telephone Nick on 07913 256697. For more information about Signs Express please click the above logo or contact them at: Signs Express (Exeter) Unit 5, Waterbridge Court Matford Park Rd Exeter, EX2 8ED, tel: 01392 823220. This article can be also found on Signs Express website. The draw took place on Wednesday, December 14th at 7pm at the Park and was attended by City players Lee Holmes & Jordan Moore-Taylor. We were also delighted to welcome Simon Willcocks & Russell Lemon from Exeter Nissan together with Stuart Doderer from ‘GreenMyBusiness’ all of whom helped to draw the lucky winning tickets for the prizes they had donated. All in all there were 20 prizes up for grabs. We are pleased to announce that a sum in excess of £800 was raised to be used to help improve facilities at St James Park for supporters with disabilities. 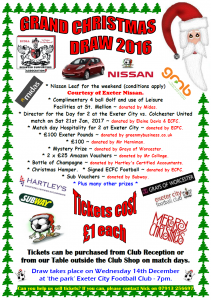 We would like to thank all those who so kindly donated prizes for the draw including:- Exeter Nissan, GreenMyBusiness, Midas, Subway of Sidwell Street, Mr D Herniman, Grays of Worcester, Hartley’s Certified Accountants, Mr D Collinge, Exeter City FC, Exeter City Supporters Trust, One Game One Community and ECDSA committee members together with everyone who sold and purchased tickets. 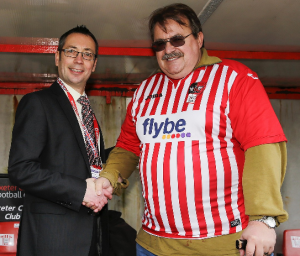 ECDSA chairman Nick Saunders said ‘the Christmas draws are a major fundraiser for us, but without the support of local business and individuals we could not achieve as much as we have in helping to make the match day experience at Exeter City so much better for all supporters with disabilities – thank you all so very much’. We hold our 10th anniversary event and raised funds for Reverse Rett. On Tuesday, April 18, we hosted our 10th anniversary event at St James Park, with use raising £837.66 for the Reverse Rett charity. Our partners Exeter Nissan and Green My Business kindly donated towards a small buffet. The night was hosted by our vice-chair Andrew Barge, and began with a presentation of our achievements over the past 10 years. We wanted to give something back, and decided to use our anniversary event to raise awareness of Rett Syndrome, and to help raise vital funds for medical research conducted by Reverse Rett. Our first president and who held this position for four years was former City midfielder Bertie Cozic who made 98 appearances for the Grecians between 2006 and 2011, and was part of the team that was promoted to League One in 2009. Bertie’s daughter Lily-Rose has Rett Syndrome, which affects nearly every aspect of a girl’s life: their ability to speak, walk, eat and even breathe easily. Former City players Wayne Carlisle and Bertie Cozic, were joined by current City first-team players Lee Holmes (our current president), Jordan Moore-Taylor and EFL’s Young Player of the Year Ollie Watkins, and our Ambassador Mike Mullarkey, linesman at the 2010 World Cup Final, for a Q&A session. Topics for the Q&A included player’s football heroes, most memorable moments of their careers so far, and a discussion on the standards, and future of refereeing, and if video replays are a good idea. The blind auction, refereed by Mike Mullarkey, proved hugely popular and included an Alan Shearer signed Blackburn Rovers Premier League winning Shirt, a George Friend signed Middlesbrough shirt and many others. The night ended with a fitting tribute and presentation to our chairman Nick Saunders, who is stepping down after 10 years of being chairman. Committee member Martin Robertson explained that Nick had been the driving force behind making ECDSA the success it is today, and how he has been influential in making sure anyone enjoys matchdays at St James Park. At the city match vs. Morecombe we were joined on the pitch by Bertie Cozic to hand over a cheque for £837.66 to give to Reverse Rett. Our members have voted Christy Pym as Most Improved Player of the Year. 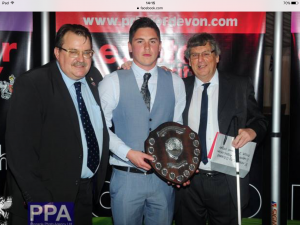 Presenting the award at the Exeter City end of season ball on Sunday 30th April from left/right, ECDSA committee member Martin Robertson and award sponsor Steve Gazzard. 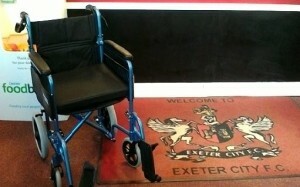 The Exeter City Disabled Supporters Association ‘Most Improved Player of the Year’ award was first awarded at the end of the 2007/08 season and past winners have been: George Friend; Dean Moxey; Liam Sercombe; James Dunne; Scot Bennet; Artur Krysiak; Tom Nichols; Jordan Moore-Taylor and last year’s winner was Ollie Watkins. Below is our chairman’s last report as Nick is standing down after setting up our association back in 2007 and holding the post of chairman for 10 years. 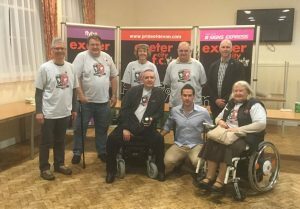 Hello & welcome to this the 10th “yes” 10th’ Annual General Meeting of the Exeter City Disabled Supporters Association and the following is my 10th and sadly my last report as your chairman. 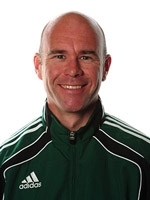 Ambassador: Former England Premier League & FIFA Assistant Referee Mike Mullarkey continued as our ambassador and attends meeting when possible. President: For a very short time Danny Butterfield continued as our president until he left the football club to take up a job at Southampton FC. The great news is that Lee Holmes accepted our offer to replace Danny and Lee kindly supported us attending some events through the season, so thank you Lee for your fantastic support. We had the pleasure in sponsoring Lee Holmes training kit. Match day accessible parking: We continued to allocate accessible parking on behalf of the football club. This ensured that all spaces were used on match days by those with disabilities only. Level Playing Field membership: We continued to be fully paid up members and this ensured we could get any legal advice and support if needed on any disability issues. Bucket collection: The football club again kindly gave us the opportunity to have a bucket collection which this time was the Portsmouth game on 27th August and we raised a fantastic amount through fans overwhelming generosity and the half-time given up by all our bucket collectors, thank you. New banners: Sign’s Express very kindly donated 2 banners so we can advertise ourselves a bit better and enable us to become more visible. Stadium Manager: We welcomed Mark Latham, the clubs newly appointed stadium manager and Mark has been attending all our meetings and we’ve been working with him on some issues and he’s been fantastic in helping us sort out these. Issues ranging from: repainting of lines in the designated bays; coat hooks, reposition of loo roll holders and running water in the accessible toilets; signage; accessible parking relocation and painting plus installing a new radar key locking system. The relocation and painting of accessible parking spaces plus locking system all paid for by our association most recently. Christmas draw: Draw took place on 14th December here at the Park and was attended by City players Lee Holmes & Jordan Moore-Taylor. We welcomed Simon Willcocks & Russell Lemon from Exeter Nissan together with Stuart Doderer from ‘GreenMyBusiness’ all of whom helped to draw the lucky winning tickets for the prizes they had donated. We had 20 prizes up for grabs and we must thank all those who so kindly donated prizes: Exeter Nissan, GreenMyBusiness, Midas, Subway of Sidwell Street, Mr D Herniman, Grays of Worcester, Hartley’s Certified Accountants, Mr D Collinge, Exeter City FC, Exeter City Supporters Trust, One Game One Community and ECDSA committee members together with everyone who sold and purchased tickets. Re-development: Our representatives have had many meetings with Justin Quick (the club’s adviser on developments) and we’ve all been working on the concerns and issues we had with the plans and we hope Justin has taken on board all our worries as redevelopments have now started. We will continue to keep an eye on things and we look forward to hopefully seeing the changes we’ve kindly asked for and within the redevelopments limited budget. ECDSA Partnership: A first for us, we have formed partnerships with Exeter Nissan; GreenMyBusiness and most recently, Signs Express. This is a show of our success over the years and we welcome their support and working with us, like they did when we held our Christmas draw and Anniversary event. 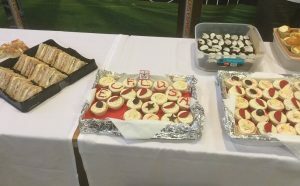 10th Anniversary event: On Tuesday, April 18th we hosted our 10th anniversary event at St James Park, with all money raised going to the Reverse Rett charity. We wanted to give something back as we’re always raising funds to help our football club, so we decided to use our anniversary event to raise awareness of Rett Syndrome, and to help raise some vital funds for medical research conducted by Reverse Rett. Our first president and who held this position for four years was former City midfielder Bertie Cozic. Bertie’s daughter Lily-Rose has Rett Syndrome, which affects nearly every aspect of a girl’s life: their ability to speak, walk, eat and even breathe easily. I am sure you’ll all agree that this was the best and most fitting way to celebrate our 10th Anniversary. Amount raised to follow. I am sure you’d like me to go over what we’ve achieved over the past 10 years “here goes, only joking” as I’m sure you’ll all want to go home tonight. Most Improved Player award 2016/17: Members were asked again to vote for their ‘Most improved player of the year’ and this year’s winner was Christie Pym. The trophy was presented to Christie by committee member Martin Robertson and our trophy sponsor Steve Gazzard at the club’s end of season ball. Social media: We now have our own Facebook page, which allows us to get our news out more quickly and effectively. New ECDSA badge/logo: With support from Scott Palfrey (ECFC marketing) we we’re able to refresh and update our logo with a new design and look, which we had made into fantastic looking limited-edition pin badges. All new members and those renewing will be given a badge as part of their membership at no extra cost. Membership is still at a steady level and long may it continue. We’ve high hopes of the association having over 100 members, which I’m sure will be achieved one day in the near future. 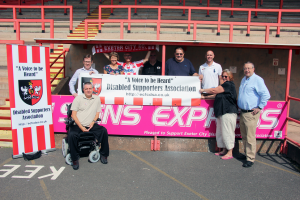 Our association is still supportive of the South West Disabled Fans’ Experience Forum as founder members with last year’s forum taking place at Bristol City and was another great success with the next forum taking place at Newport County in October this year. As stated at the beginning of this report this is my last chairman’s report. As your chairman for the past 10 years I hope I’ve fulfilled my duties well and with dignity. It’s been a real privilege and honour being chairman to this fantastic association and I’ve been able to work with some fantastic people. In my time as chairman Jeanne and David Jones have been by my side as founding committee members and have supported me through some very differcute times and without them I think I would not have lasted 10 years, so thank you both for your fantastic support and continued friendship. The association will continue to be a success as it has done for the first 10 years under my chairmanship and will continue to do so under the stewardship of new chairman and committees in years to come. I would like to finish by thanking the committee for all their hard work and time given for the benefit of our members and Exeter City over the past season. Our partners, Exeter Nissan; GreenMyBusiness and Signs Express for their support. Mike Mullarkey and Lee Holmes for their fantastic support of our association and to all our members for their continued support and to Exeter City Football Club for allowing us to use their facilities, again for free, for our meetings and finally to you all for attending this year’s AGM. Thank you all for your fantastic support over the years and thank you so much for listening. Below is a statement from our Ambassador Mike Mullarkey. ‘I am sorry I am unable to attend the AGM this evening. I am currently on holiday in Spain and whilst it sounds idyllic I am being thrashed at golf by my Son and a good friend of mine so you can imagine the abuse I am taking…. nothing I am not used to! I would like to commend the Committee Members on another tremendous year for the Association. To Nick and all the team, the work and dedication you put into improving things for disabled supporters of our great club is hugely appreciated and an inspiration. It says everything about the organisation that whilst hosting an event to commemorate our 10 Year Anniversary, the decision was taken that funds raised should support Bertie’s very special charity. A fantastic gesture and I was delighted to be present to support that event. My change of role in my professional life has not made it any easier to attend meetings etc. So, for this I apologise and would understand if you wish to take the opportunity to seek an alternative ambassador? Lastly, I must add my tribute to Nick as his tenure as Chairman comes to a close. Your work in getting the association up and running and then steering it so well through the last 10 years, building membership and, just as vitally, links with the club has been just outstanding. The Association is in a tremendous position to push forward still further and you should be immensely proud for what you have achieved.